So what’s all this #MarchIsHealeyMonth? 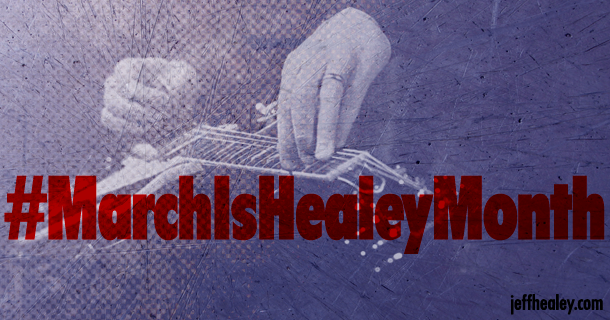 Starting this year, we are officially declaring that March is *Healey Month*! Why? ‘Cause we said so! Two extremely important dates in Jeff’s history fall in March. On the 2nd, we take time out to mark the sad anniversary of his passing (in 2008) and on the 25th, we celebrate Jeff’s life and rich legacy by remembering what would have been his birthday (49 this year). So, we figured why not stretch the celebration out for the entire month? As soon as we have more details about this cool doc, we will be certain to pass them on! There’s great news for Toronto Jeff Healey fans! See the Press Release below for all the deets! Jeff Healey’s Jazz Wizards reunite for 2015 Jazz Celebration! 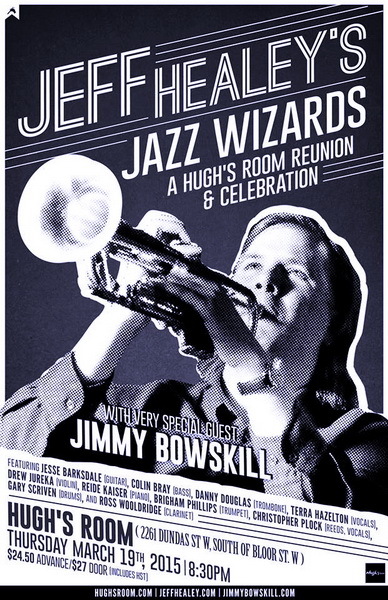 PRESS RELEASE: Jeff Healey’s Jazz Wizards reunite, (with special guest Jimmy Bowskill opening) to fire up a jazz band ball celebrating what would have been Jeff’s 49th birthday at Hugh’s Room Thursday March 19, 2015! *When : Thursday, March 19. Doors 6:00pm. Showtime 8:30pm. Dinner reservations should be made in advance. Jeff Healey, finally placed in Canada’s Walk of Fame last year, died in March 2008 — and left behind two distinctly different bands. His rock band which sold millions of records, and allowed him tour the world — and his equal passion, the Jazz Wizards, a band that revived the classic jazz of the ‘20s and ‘30s, and which featured him playing trumpet as well as guitar. The Jazz Wizards will reassemble at a special concert at Hugh’s Room in Toronto on Thursday March 19 to mark what would have been their former leader’s 49th birthday (March 25). Original members of the Jazz Wizards taking part include Jesse Barksdale (guitar), Colin Bray (bass), Danny Douglas (trombone), Terra Hazelton (vocals), Drew Jureka (violin), Reide Kaiser (piano), Christopher Plock (reeds, vocals), Gary Scriven (drums), Ross Wooldridge (clarinet). Brigham Phillips will play Healey’s trumpet parts. Opening the show will be blues guitarist and singer Jimmy Bowskill, a young artist who was mentored by Jeff Healey. Jeff heard Bowskill, then aged 11, busking outside his club at Queen and Bathurst and invited him inside to perform. Since then, Bowskill — now 23 — has built himself a solid career on his talents. Cristie Healey will host the event; plans are being made for a portion of the revenue to be donated to Daisy’s Eye Cancer Fund, an organization Healey vigorously supported. The concert is being presented by Richard Flohil, who formerly worked for five years as Jeff’s publicist. And lastly for today… photographer James St. Laurent has now made available for pre-order, two *beautiful*, ready for framing limited edition, signed photo prints of Jeff in action! James is graciously donating a portion of the proceeds to Daisy’s Eye Cancer Fund in Jeff’s name. Please check out the link (& scroll through to pre-order) ! 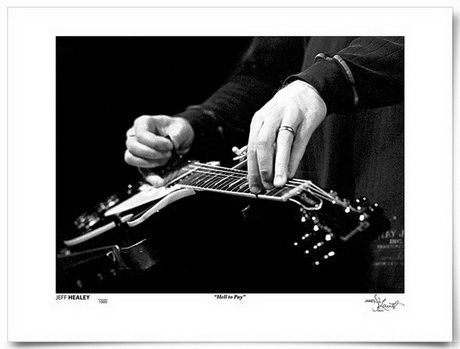 Prints will be available on March 25th – Jeff’s Birthday! Beautiful Numbered Limited Edition Prints! “The 18X24 inch signed and numbered archival images are printed on d’Arches Verano paper & shipped rolled in boxes. Each print is $99.99 CDN +shipping via Canada Post. 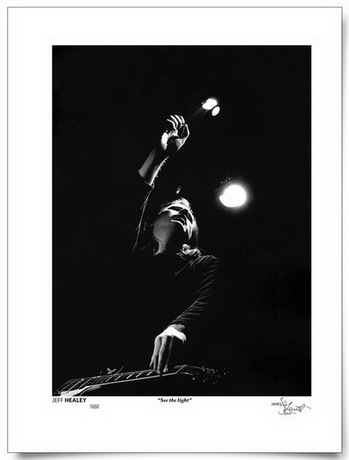 …and you can pre-order the prints from James HERE. Thats when does his classic signal for any band……..Lets git her done move! On Ya’ Rog’ for the “Marchishealey month idea!! !.Like eveyone on here,I’m still the fan I was when I first saw Roadhouse’,And Tecka’ pays tribute to Jeff & the late S/R/V every week on Tecka’s Rock & Blues Show’ .Best to all you fans on this website. Only saw Mr. Healey in his latter years when he toured with the Wizards, so glad I was able to see and hear him in the flesh. Just saw Jimmy Bowskill a couple nights back performing with the Sheepdogs. Unbelievable show! Nice to see Canadian rock is in good hands and it’s great to hear Jeff’s far from forgotten.